Sometimes, a picture just begs to be used. Friday evening saw Cunard’s three regal monarchs, Queen Mary 2, Queen Victoria and Queen Elizabeth, arrive off the Isle of Wight from Southampton on their way to their latest voyages as the Cowes Week regatta came to a close. The Red Arrows had just performed at the sailing extravaganza. Put the two together, and hey presto. 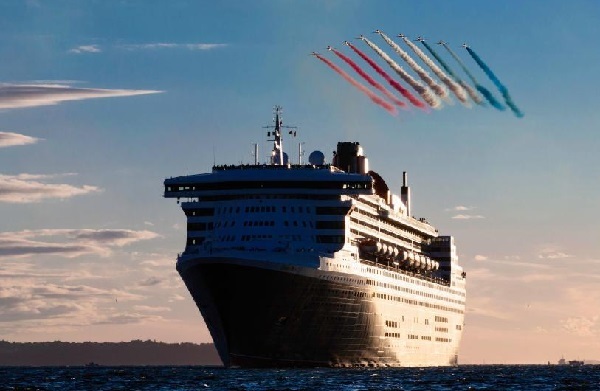 The aerobatic send-off marked the first time Cunard guests had the chance to see the flying display while on-board. It was also the first time the three Queens had docked together in Southampton since 2016.